Getting out and getting active is a given in Boulder, which has been named the fittest city in America approximately 9 zillion times by all kinds of list-makers. 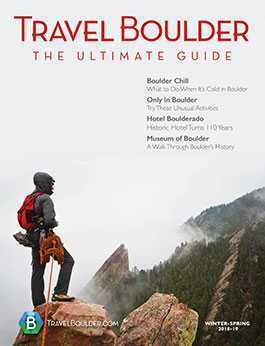 Outside Magazine also called Boulder the best place in the country for outdoor sports and Storage Talk crowned Boulder the nation’s No. 1 Best City for Outdoor Recreation Enthusiasts in 2015. There’s good reason why a legit amount of professional and elite athletes move to Boulder to train. The city leans right up against the mountains, so they’re like your own natural obstacle course for climbing, hiking, jogging, fishing, biking, snowshoeing, and cross-country skiing. Oh, and downhill skateboard racing, ultrarunning, parkour, or free-climbing, if you’re one of the city’s many extreme thrill-seekers. In the winter, Boulder’s a short drive to a medium-sized, local-fave ski resort, Eldora Mountain Resort. Year-round, Boulder’s Chautauqua Park (a National Historic Landmark) offers a straight shot up the spine of the Flatiron Mountains, with trails for all fitness levels. Throughout the year, Boulder’s the host to an endless stream of races, from the Bolder Boulder to the Ironman competition. Here’s how to experience Boulder’s sports and recreation.